This can be a hot topic. I have heard many extreme stances on this. Some feel it is unAmerican to accept government aid. Others think those who do receive are abusing the system and lazy. General stereotypes are always dangerous because each story is different. I have known a lady who knew her 5 year limit of aid was coming to an end so she was trying to make up a disability for her son so it could continue. So that is abuse of the system but I have known far more stories of those who fall on hard times and needed help. I grew up on food stamps and being on medicad. There was alot of foolish choices on the part of my parents who were addicted to drugs and alcohol. But I praise God for the help we were given. My siblings and I should not have be punished for the mistakes of our parents. But even after becoming clean, minimum wage was not enough to care for our family of 7. I have learned to be careful with having strong opinions and being judgmental of others. We don’t know all of the homeless man’s story or the single mama’s story or anyone elses story. It is better to err on the side of grace. 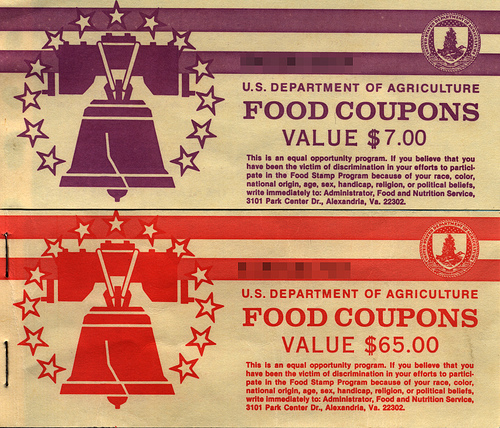 It is easy to have a strong opinion on food stamps/any government aid until you become so desperate that you reach the point of needing the help of the government and you stand in line, wait hours in a crowded room eating humble pie. I speak from personal experience. I had always been the ride to these places and helped others apply all the while thinking, “I hope everyone here knows I am just their ride and I don’t actually need help.” And then the day came when I needed help and that was the worst humble pie I had to choke down. No doubt I was humbled and my pride stripped away but praise God because pride is an ugly thing I do not want in my life. I was thankful that this arrogant pride was exposed in my heart. I don’t want it there. Pride is always a battle for me. This is all to preface a really cool story of God providing for someone living in poverty. Someone recently shared with me how they felt like God was prompting their heart to tithe from their small earnings. It does not matter how much we give but that we do joyfully give first instead of giving from what is left. The practice of giving 10% is something that was practiced in the Bible and is still done today. It ought to come out of a heart of thanks and not of obligation. This person said they had not tithed in a long time. They committed to doing it even though they knew they would be short for bills but trusted God would provide. Days after they wrote the check and unexpected gift card came in the mail for $100 to Target.